I’m trying to cook as many recipes from my Nigella cookbooks as possible, and started a series to cook through How To Be a Domestic Goddess some time ago. 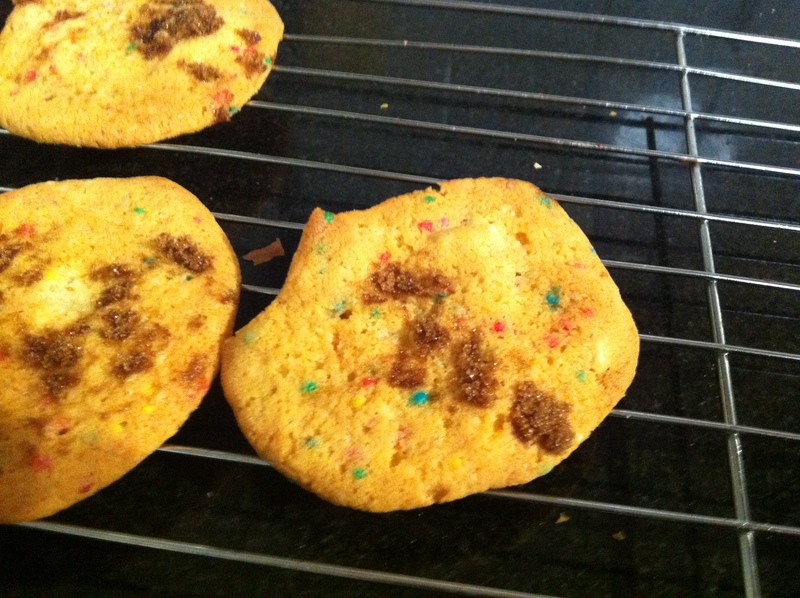 Well, it’s been on the back burner but here’s a review of her Salty Sweet Peanut Cookies. Nigella says that there’s “something about the contrast between salt and sweet and their cumbly lightness that makes them instantly addictive” and I’d have to agree. These went furiously fast in my house. Make them. Nigella notes not to use all butter but to use a mix of vegetable shortening and butter in the recipe. I don’t have vegetable shortening on hand as a general rule so instead I used half butter, half dairy blend – there are some vegetable oils in that! They turned out fine, so I’d say it’s not quite as prescriptive as she makes out. 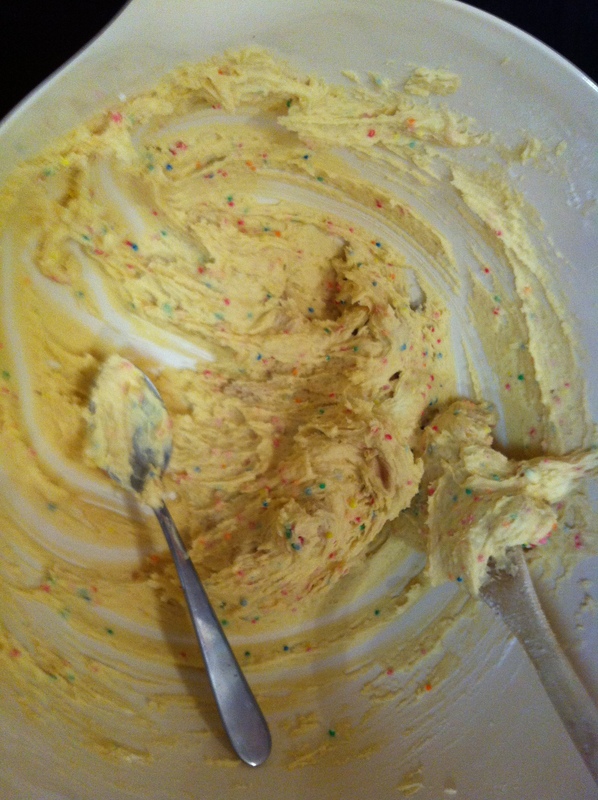 Mine probably spread a bit due to the margarine, but I liked ’em that way. In the pictures I’m about to show you, astute eyes may notice that there are hundreds and thousands in the mix. This is not a Nigella condoned addition, but I had absolute shedloads* left over after making cake pops one time, and tipped them all into the bickie mix to save having to chuck them out. I think they make the biscuits look cute and playful for a kids party, don’t you? *In this instance “shedloads” refers to about 3/4 of a cup of hundreds and thousands, where “a squillion” if used on the same context would relate to the entire packet of 100s and 1000s. Blobbed reasonably far apart as they spread. Another recipe note: Nigella’s recipe said to press brown sugar onto the cookies prior to baking them. I did on some, and it looked crap. Don’t do it. Here’s a cautionary picture to drive home the tale. The biscuits don’t need it. This is so easy. Preheat oven to 180 C / 375 F.
Beat together sugar, butter(s), egg and vanilla – with electricity helping you if available! Sitr in the flour and peanuts and hundreds and thousands. Blob the dough onto lined baking trays in any size you like. I am a fan of large biscuits so did around a tablespoon of mixture each time using two teaspoons (Nigella calls for a much more moderate 1 teaspoon of mix!). Leave them around 5cm apart as they will spread. Bake for around 10 minutes for the first tray, and 8 minutes for each tray after that (I find my oven gets hotter and hotter) until they are cooked and cool on a wire rack. 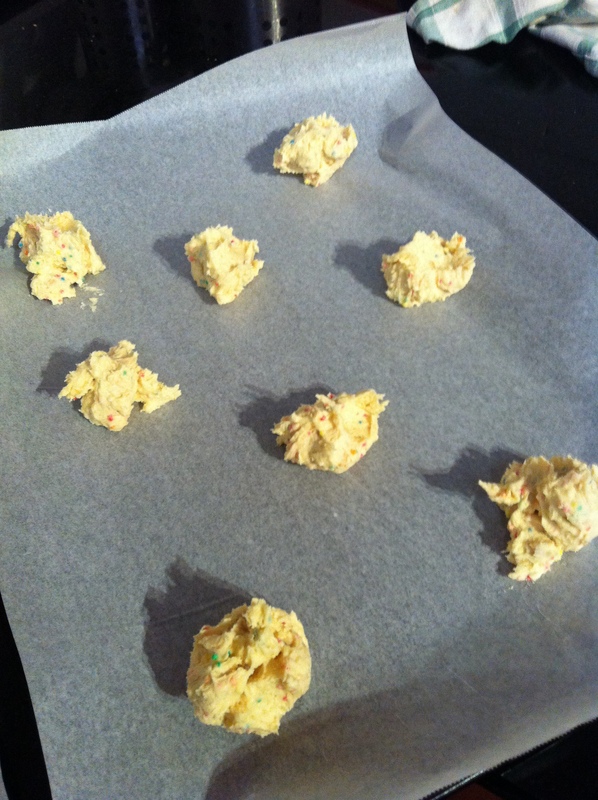 Tags: cookies, how to be a domestic goddess, nigella, peanut butter, recipe, salty, sweet. Bookmark the permalink. They were. And they are very much in the past tense! 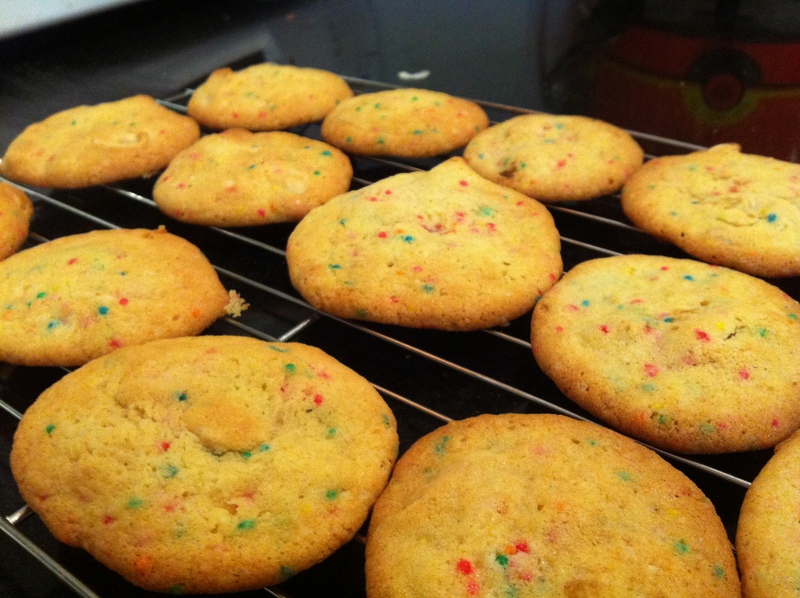 Yum, they look good. I made Nigella’s ginger and pear muffibs from the Expres sbook yesterday. That recipe also calls for brown sugar on the top, it is totally not neccessary.